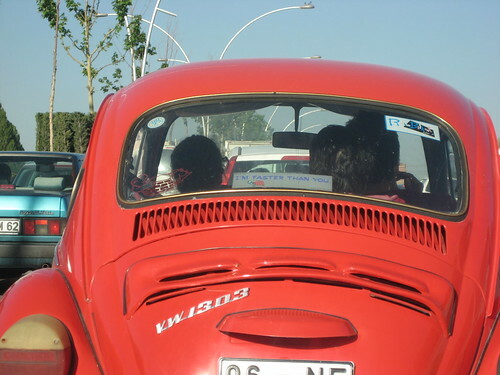 Given that this day was slow … speaking of which, take a look at the sticker on the VW Beetle (just click on the picture for a larger view). So, back to the slow day. Because it was slow, it gives me a good opportunity to let go of some thank yous to those who have given me words of feedback as of late. The blog now has a good number of regular readers and your comments and messages (by way of email, comments on the website or otherwise) are always greatly appreciated. One subscriber for example reads the messages while taking a break giving swimming lessons in Spain, some read printouts while waiting at the doctor’s office, others are too tired to read the long-winded texts I am producing, but they really like to take a look at the pictures here and on the flickr site. Yet others have taken a liking and can’t seem to wait for updates after finding it quite frustrating to have a new message pop up every day or so in the beginning. Others (e.g. here and here) are touring themselves and are having similar experiences in a lot of ways. Thanks for letting me know about all this and keep the comments and questions coming. There are two people who have sent me a particular uplifting and challenging message. M & M’s anniversary is approaching in about three weeks time. They are as they say “avid” readers of the blog and have decided to forgo an expensive dinner on the occasion and instead make a donation that day (for more information on the charity portion of this project, go here). Specifically, they will donate the amount of kilometers I am covering that day in Euros. Thank you M & M for this and I am planning on not making it a rest day I suppose. The remaining day was filled with visiting relatives in the sprawling mass that is Ankara, passing by the country of bread among other places and eating yummy chocolate banana cake to top things off. Off to a late start again. It’s sleeping time these days and a) I am catching up a lot it seems and b) it is deeply necessary it also seems. Take today. I slept for about 9 hours during the night and then in the afternoon for another 4 hours. I usually never sleep in the afternoon. But it seems like my body is telling me to do something so it gets what it asks for right now. And that is food and sleep. Before my comatose afternoon, I wanted to get some information on my US visa from the embassy here in Ankara. I figured that information wouldn’t really hurt and that I might as well start the information gather process. My questions largely centered around time issues as I will need to apply for a longer visa if necessary in some part of Central Asia. So here we go - Haluk drives me to the embassy, I am sort of prepared with prior internet research and know that the Ankara embassy operates by appointment only. So much for rules. There have to be exceptions. I show up and ask whether it is possible to speak to a consular official. Turkish security tries to direct me to the internet and the phone. That didn’t work I explain. They say no. I ask for the supervisor. They send me to a different gate. 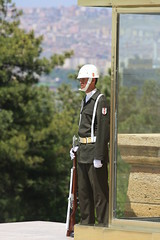 I speak to the Turkish security supervisor, a nice guy as it turns out. His name is Murat. I explain the situation … bike tour, not much time due to visa restrictions, try to have things in one place, yada yada. His first reaction: “You’re crazy! I used to be a bike myself, but not a 15,000km one!” He also says that speaking to a consular official is impossible. They changed the rules a couple of years back - no exceptions. I try the “I’m a lawyer and know there are always exceptions to the rule” angle and he says he will see what he can do, speaking to his boss. If he says no, it would be a no. He seems sympathetic due to the biker bond. The little Turkish I have picked up so far makes me realize Murat is going to bat for me. He explains the situation in great detail. When he turns around, he says: “Go back, my people will let you in!” A big thanks to Murat. I get my answers that I need from the consular staff, know that things are generally possible now and that it is possible to not leave the passport with the embassy for purposes of issuing the visa (kind of hard in former Soviet countries, where you need to have the passport at all times as I have found out in a subway station in Tashkent at one point; milita asks me for the passport, things are OK - but an old lady curses them out for pestering foreigners for no reason - great scene) and that I should be able to have a visa issued within no more than 3 weeks with all documents being in order. That should be possible in the end. As Haluk needed some things from the mall we also entered one of the countless of such consumption temples here in Ankara (you know you’re there when you see a big mobile phone company store starting with an N, a mobile plan provider starting with a V, a Swiss formerly very hip watch company, a sweat-shop producing athletics store and the ubiquitous coffee company with a Seattle, WA HQ). You also know you’re there when hip young Turkish couples try to get fit by using a game console to get fit. The trip here was also an exercise in being catapulted from the Turkish hinterland (where biking shorts are looked at suspiciously and with a derisive snort at times) to the fast-paced and extremely modern face of Turkey. I slept. Slept like a stone. My body needs rest. Even when I didn’t sleep, I felt tired and it is as if waves of tiredness are washing over me. I am thinking now that I am hesitant to take breaks for that reason. When I do - mostly on the second day of a break - I get extremely tired. On the other hand I should be taking more breaks. I know that - rationally. But biking is just a lot of fun and most of the time I have this urge to keep moving. The rim is on its way now and will hopefully arrive early next week. 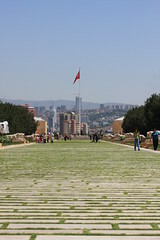 In the meantime, Haluk showed me the Ataturk Memorial. Funny places, these memorials. Tombs … most of them have tombs of course. This one happens to be empty. The real one is below the main hall somewhere, but the reverence will always be a public one in this hall. I somehow can’t do much with such national symbols and find them in some sense comical. I don’t want to arouse any misgivings, but a lot of times wonder whether and why we seem to need such places as an expression of some kind of national identification. Call me post-national or whatever, but it just doesn’t do a whole lot for me. This sentiment has only become stronger the more I travel in places with strong national feelings engrained in people. Add to this that the title of the whole project - Cycling Without Borders - is an expression of a deeply-held personal belief and you get the gist of what I am saying. 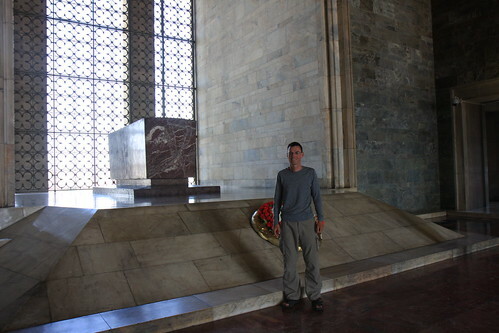 Alright, enough pondering for the day … here I am in front of the tomb of Ataturk. The rest of the day was quiet. We got back to the apartment and I got a better look at my wheel, making sure that the brakes were in good shape still getting to work on phone calls to the University of Miami administration to get the ball rolling on my US visa that I will have to obtain in the process of this trip. I hope to be able to do this without having to fly back to Germany for some reason. Keep your fingers crossed. Murat and I had breakfast and this time we parted ways personally instead of over notes. I rolled slowly to the bus station amidst the construction sites dotting Kayseri. When I pulled up at the bus station (a sleek new building with security all over the place), the security guard inside the front entrance wasn’t too happy about me placing the bike near the entrance instead of the bike racks 100m away. I wasn’t going to do that in order to buy a simple ticket. He was standing inside the glass front trying to impress me with wide-open eyes and by pointing to his badge (a company logo) and then to the bike rack. I motioned to leave it here and locked it. He came out: “Problem!” I told him I will buy a ticket. “OK.” That was it. Bought a ticket, boarded the bus and five hours, a lot of climbs and a break later I arrived in Ankara. As I get off, Haluk comes out of the terminal and greets me with a cheery hello. We make our way to his similarly cheery yellow car, somehow manage to get everything inside and head to their apartment in the center of the city. I will be able to stay here until the replacement arrives, thanks a million for this!!! Believe it or not - no picture today. Zero. Nada. Keines. I had expected to mull things over in my head a lot more, but I have pretty much accepted the situation (was there anything else I could do?) and figure that the rest is welcome and probably necessary. Another bad night - the yummy food from the night before took its toll. It was too oily, which I didn’t realize when I ate it - and probably too spicy. So much for that. This didn’t bode well for the day and I couldn’t eat much for breakfast. I had also missed out on bidding farewell to Murat because I slept through my alarm after having been up for part of the night and he didn’t want to wake me up. I slowly moved about the apartment and eventually closed the door behind me and set out. What a crummy feeling in my stomach … just like a few days ago on the way to Goreme. Not quite as bad though, but still not a good way to start the day. I decided to give it a go on bananas, water and Coke … and so it went. After negotiating traffic on the other end of Kayseri, I got to work on an uphill which kept me busy for the next hour or so. My hunch is that it was about 12-14km long with undulating terrain afterwards. Mostly uphill. It was also not very inspiring landscape as the day was dull. So was my mood. Rob makes a good point and my thoughts were similar today. Through this blog you get a certain view and I try to be as open and honest as I can be, but it certainly is biased and depending on the mood I am in, I am leaving things out or putting a certain perspective on it. The last few days were days where I didn’t feel like whipping out the camera at times. A few weeks ago I might have. But oftentimes, there are stories that I probably don’t tell, feel that they are insignificant or push them to the back of my mind. Today was a day where I just went about doing what I felt I should do. One pedalstroke after another … moving slowly up the hill, taking a break and just clocking miles. Having biked for a number of years may help a good deal to get your mind off of things and just be there in the moment. Had I felt better, the day may have been totally different. 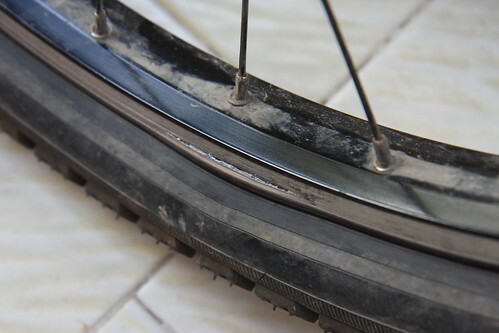 Argggghhhhh … the rear rim was broken. Strangely enough, my feelings were either muted or I simply accepted the situation as was. Nothing to be done about it. I didn’t scream or yell out. I simply put the packs on the bike again after opening up the brake. I rolled down the hill and up the next, wondering what to do. A minute after I was back on the bike, I took out my phone and called Speedzone to tell them about it and asked whether they could put a new wheel together for me. Easiest thing I could do and I knew things would be done right instead of running around Ankara and Istanbul trying to find something that I have a hunch might not be there. Dirk was on and said they would build it the next day. Thank you so very much … they are busy these days for sure and with Dirk’s shoulder being injured I do not take this for granted. What happened you may ask? I cannot tell you. No impact, the tire is good. Too much weight? Not really, I am not loaded up very heavily. Faulty material is all I can think of right now. I couldn’t go on much longer I knew. The town in sight about 3km ahead, I went there. Internet cafe, bus station, etc. I arrived, made a call to Murat, asking whether I could come back to Kayseri that night and he immediately said to hop on the next (and as it turned out: the last) bus to Kayseri. The day may have been shot, but you can always take a picture of a bunch of kids swarming around your bike. So, on the bus I was to Kayseri. And the landscape looked completely different. What had been dull and gray all of a sudden was lush and green. The sun had come out and was now beaming at a low angle. The clouds around Mount Erciyes had disappeared and the whole area was now gleaming in a golden glow. 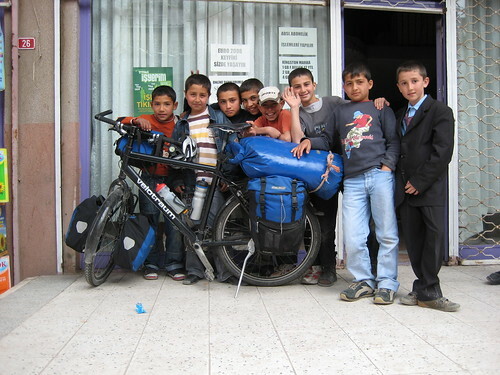 I arrive in Kayseri and pedal back to Murat’s place … wait for him there and get a taste of Turkish hospitality. I was calm about the fact that I was stranded now. But I also just wanted to be left alone. All neighbors seemed to be converging on me though as I was sitting waiting for Murat who came about half an hour later. I had hedged a plan on the way back: things being delivered much more quickly in Ankara, I would go there if Gokce’s parents would be willing to have me around. They were … just said to hop on the bus and they would pick me up. So, that’s what I will do tomorrow. Get up early, hop on a bus and then head to Ankara to wait things out. In this sense it is also good that I didn’t continue on last night. Thanks to Murate for putting me up for another night and for organizing things at such short notice. Thanks also to Haluk und Guler for letting me spend more time with them in Ankara. The forced break might have its good sides too. As Patrick has pointed out, Hesse happened upon an indigenous tribe and found that they stop at times so that they mind can catch up with their bodies. Given the mileage as of late, this might not be a bad idea. 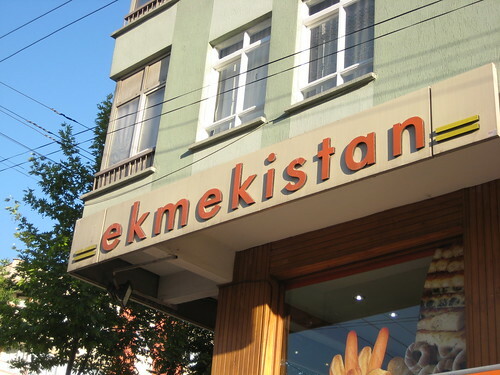 And finally, I should go back to Altinekin and talk to the police guy there: “You are going to Ankara!” I am indeed.